Here's one of the recipes featured on Alton Brown's show recently. Heat the olive oil and sesame oil in a 12-inch saute pan over medium-low heat. 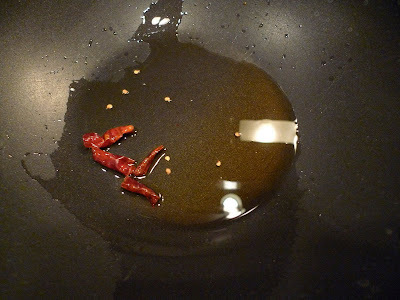 Add the arbol chile and cook, stirring frequently, until the chile begins to give off an aroma, 30 to 45 seconds. 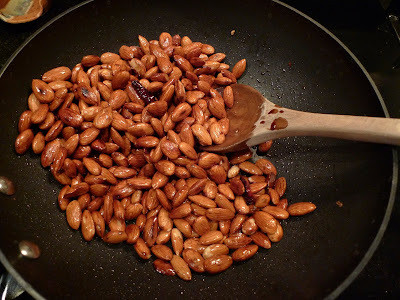 Add the almonds and cook, stirring frequently until lightly toasted, approximately 5 minutes. Add the soy sauce and Worcestershire sauce and cook until reduced slightly and the pan looks dry, approximately 1 minute. Immediately remove the nuts to the large bowl and toss with the ginger mixture. 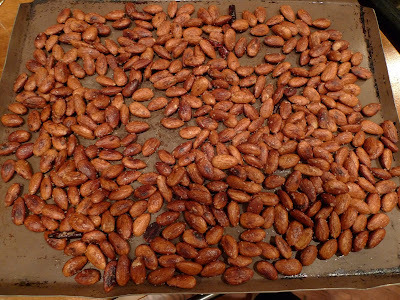 Spread the coated nuts into a single layer on a half sheet pan lined with parchment paper and bake in the oven for 20 minutes. Remove the pan to a cooling rack for at least 30 minutes or until completely cool. Store in an airtight container for up to 1 week. So what is my final verdict? I was expecting some freaking amazing nuts so when I tasted it straight from the oven, it was a big let down. It almost tasted bland. 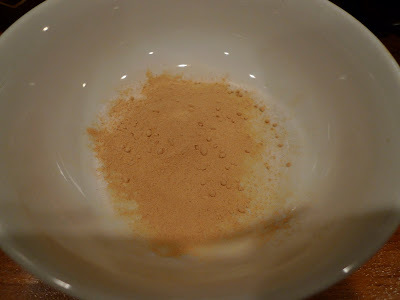 I know, how can ginger and chile be bland, but it was. Maybe it was because I was munching on a lot of different things in the kitchen that day so the flavors felt a bit muted. However, the next day, when I brought the almonds to work to eat, the flavors decided to finally show up. I was so wrong about it being bland. If anything, they have tons of spice and crunch. I have them hidden in my drawer because the ginger is pretty pungent. haha. It was really easy to make and it's a nice change from eating raw almonds. 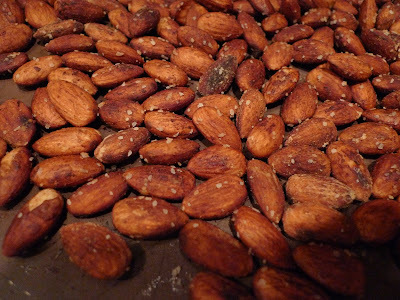 I'm going to look into making some candied almonds next time.